Located at the heart of Coquitlam, Lafarge Lake is just one of a dozen urban lakes that provides convenient access and fast fishing for entry-level and youth anglers. The lake is regularly stocked with rainbow trout between March and November by the Fraser Valley Trout Hatchery. 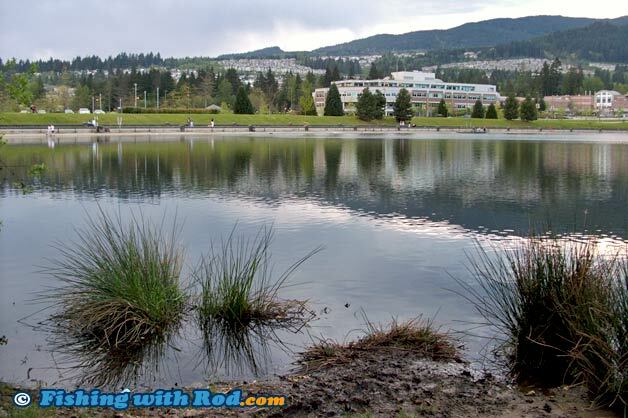 Lafarge Lake is located at Town Centre Park in Coquitlam. The best access is via Pinetree Way North. Several parking lots are available around the lake. The entire shoreline can be accessed by a walking trail. Fishing can be done year-round at Lafarge Lake. The best fishing months are March to June, and September to December. During spring and fall, Lafarge Lake is aggressively stocked with rainbow trout by the Fraser Valley Trout Hatchery. Fishing can either be done from shore or in a float tube. Lafarge Lake is bordered by a nature trail so shore access is very easy. The beach along the western shoreline provides an open area for beginners but the depth change is quite gradual. One may need to cast quite far to have any success. The shaded shoreline along the other sections of the lake provides a good refuge on a sunny day. The depth change along the northern section of the lake is quite fast so fishing can be excellent at times. Like the other put and take lakes in the Lower Mainland, these rainbow trout can easily be enticed by either artificial or natural bait. When fishing from the beach, a sliding weight setup that anchors the bait on the bottom allows the angler to sit, relax and wait for the bites. A rod holder can be very handy to keep the rod tip up for easier viewing. Dew worm, deli shrimp, single eggs are commonly used. Fishing in a float tube gives you more options. Given the backcasting room, you can flyfish easily. Stripping or trolling microleeches usually does the trick. Casting and slowly retrieving a small artificial lure near the lake bottom also works great. Adjust your retrieving speed and pause at times to trigger a reaction strike. Common carp also inhabit in Lafarge Lake. Targeting these golden beasts can be a relaxing pastime. Keep your eyes on the rod tip, because carp are light feeders. When hooked, be prepared for several long powerful runs so it is safer to loosen your drag slightly. Lafarge Lake is located in Region 2 in the British Columbia freshwater fishing regulations. Please respect other users, local residents and wildlife around the lake by keeping the noise level down and picking up your own garbage.